Ifrah Mansour was born in Saudi Arabia, and by the time her family returned to their native Somalia a few years later it was too late. Civil war broke out, the government collapsed, and Mansour’s family—her parents, five siblings, and herself—soon left for a refugee camp in Dadaab, Kenya, one of the oldest and largest in the world. Mansour moved to Minneapolis in high school, and now lives among the largest Somali diaspora community in the country. But at 30 she hasn’t followed the Somali immigrant path that she or anyone else expected. “I was doing what everyone was doing, which is to go to college, seek a degree that will financially stabilize you and your extended family. I was on track for elementary ed. My life was set. I was going to be the perfect kindergarten teacher,” she says. Then she discovered her penchant for performance. 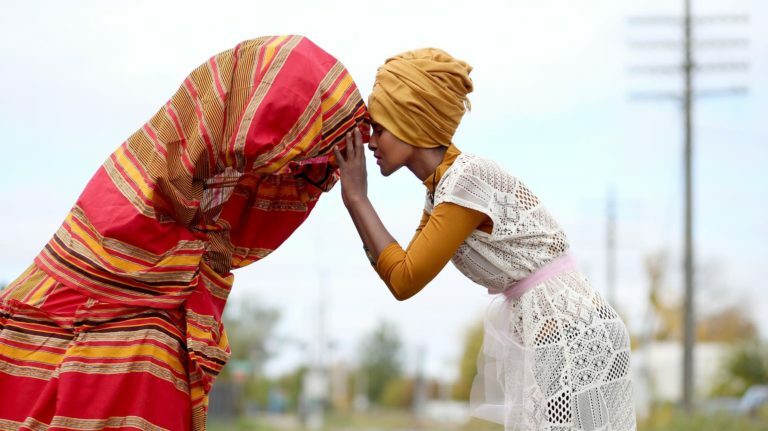 When Mia’s “I am Somali” exhibition opens on August 18, Mansour’s installation Can I Touch It will be among the art of two other Somali immigrant artists. The piece reflects on the experience of Muslim women and girls whose hijabs are yanked or touched without permission—a surprisingly frequent violation of privacy shared by pregnant women whose bellies are rubbed by strangers, people with incredible tattoos, and so on. Occasionally, Mansour says, people do ask permission—even as their hands are already reaching for the fabric. Mansour once worked in a Minneapolis daycare facility, where little girls wore hijabs fastened with a safety pin. And every day, she says, boys would pull the girls’ hijabs—and the pins would stab the girls in the neck. So she learned to write her own stories—”stories that reflected me,” she says—and to perform them. In a couple weeks, she’ll play the Minnesota State Fair, six days of pop-up performances outside the Education Building. The show, Somalia’s Balloon, takes a child’s perspective of Somalia’s colonial history. In February, she’ll perform How to Have Fun in a Civil War at the Guthrie Theater, another solo show that looks at violence through a child’s eyes. Both are by turns serious and funny, with a playfulness often lacking in refugee stories. It’s an approach that veers not just from the refugee narrative we’ve come to expect but also from the de-facto Somali history—”one sad sob story,” as Mansour has put it—largely informed by the perspective of her elders, whose deep attachment to their homeland she could not have shared when she left at age 7. She’s tired of the expectation that she is defined by what the world did to her, not by what she has done in the world. “I am Somali” opens August 18 in gallery G255 at Mia. Mansour will join the other two artists in the exhibition, Hassan Nor and Aziz Osman, for a talk at Mia on October 26.